Chuck's Road House is a popular steak house chain with locations all over Ontario. We were approached to create a brand new custom website for the entire franchise. We were very excited at the prospect of designing a brand new website for the folks at Chuck’s Roadhouse for all locations across Ontario. Their existing website was out-of-date and was no longer able to grow with the modern needs of a thriving franchise based restaurant chain. Through heavy collaborating and brainstorming with the client, we settled on a design strategy that would focus on the strong rustic identity that Chuck’s had developed, but also keep the website bright and fresh. Additionally, there was also a major focus on food and beverage, with large scale food photography and video implemented throughout the website to tantalize visitors. When the website launched, the client was very happy with the new look and feel as well as the additional tools we were able to put in place to centralize their social marketing, customer communication and ultimately grow their brand to new levels. The people at Chuck’s Roadhouse have big plans to expand their brand, marketplace and ultimately franchised locations throughout Ontario. 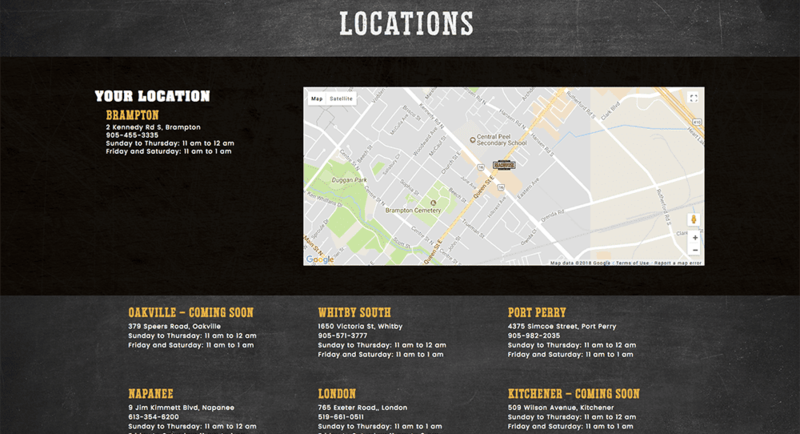 As a result, we developed a custom system to manage their locations within WordPress. The ability to assign specific promotions such as drink specials to individual locations was lauded as a feature that was sorely needed on a marketing level. Adding a new location is now as simple as entering the address, name of the location and any specials or promotions that the particular location has to offer.